Renee Beck, MFT, is a therapist in private practice as well as an approved supervisor in practicum for Integral Psychology Program Trainees attending The California Institute of Integral Studies (San Francisco). Additionally, she is an approved supervisor for Blue Oak Therapy Center in Berkeley; and offers through her practice individual and group supervision for Marriage and Family Therapist Interns, Associate Social Workers, and Professional Clinical Counselors. 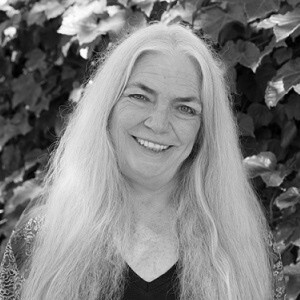 In her private practice, Beck utilizes her expertise in unique areas such as; Dreamwork, Transpersonal Therapy and Therapeutic Tarot. Beck is also the Clinical Director Emeritus at Holden High School located in the San Francisco East Bay Area. Her work at Holden High School began over 33 years ago, when she founded the school’s counseling center. In June of 2014, administration, staff and students honored Beck’s three decades of selfless service by dedicating one of the facility’s counseling rooms in her name. Renee, did you always want to become a therapist? I’ve always loved learning; my childhood aspirations were to be a vet, a nun (when I realized my religion wouldn’t allow me to become a priest), a magician, witch or wizard, a writer, musician, and a biologist/botanist. In high school in the 1960’s, I got very interested in psychology and consciousness and was very active in non-violence and peaceful political action. I also became involved in the Free School/Alternative Education movement. All of these things were intricately related in a weave of learning, deepening internal/interpersonal/social consciousness, and making the world a better place, which is what I believe the process of therapy is all about. What made you choose Dreamwork, Transpersonal Therapy and Therapeutic Tarot as areas in which to specialize? For as long as I can remember, myth, mystery and symbols have fascinated me. As a young girl, dreams were the doorway to a magical realm; fairytales made more sense to me than real life, and religious ritual and practices produced experiences that seemed so much larger than normal experience—except for my astonishment at the beauty of the natural world. I could be transported to another world in a book, gazing at the Milky Way, sinking into the dark quiet of a forest, or watching fish create nests in the sand could mesmerize my mind and enliven my heart and spirit for hours. That sense of wonder and surprise continues to this day. You began your educational journey at Boston University’s College of Basic Studies’ 2 year Utopia Project. Will you please tell us about this phase of your learning? The teaching was coordinated so all of our learning was integrated; we studied various fictional and real-life intentional communities; positive and negative, and spent the last semester creating our own version of a utopia in small groups. My focus in the group was education and youth. It was a useful project for expanding one’s vision of possibilities, and especially for learning how to work together in a group that most of us would never have chosen as a community; much learning about cooperation, listening, and group functioning! This theme continued as I attended Goddard College, which has been one of the original centers for student-centered education; with an emphasis on learning in community. Goddard had the highest drop-out rate in the country, largely due to students not being trained to be responsible for their own education. There were certain requirements, but each student had to design and carry out their own educational plan—a glorious and deep learning process in itself. My explorations then immersed me in the study of consciousness, symbol and archetypes. It was at Goddard, in the forests of Vermont, that I discovered Eliade, Jung, Norman O. Brown, and Campbell. It was at Goddard that I learned how to learn. With a thirst for understanding the physiological aspects of consciousness, I moved to California and eagerly absorbed science classes at junior and state colleges as well as through UC Extension. At the same time, I was exploring different forms of meditation, learning about intuition, energy work, East/West spiritual systems, and hands-on bodywork and Reichian breath work. I moved to Olympia, Washington, and did a 6-month contract in Molecular Biology and Biochemistry at Evergreen State College which was another alternative education experience. It consisted of 8 students focused in lab, lecture and discussion each weekday with one of several teachers in our team. The learning was enriching, but my artistic and helping-based professional friends back in the Bay Area better understood my sense of humor; so I returned to Oakland to do bodywork full time, while continuing to study metaphysics and symbology. Is this when you began your graduate studies? Yes, Antioch College West was calling, and I started their graduate program in Clinical Psychology. The community was wonderful, the teachers were brilliant and passionate, but for me there was something lacking. Imagine how thrilled I was to learn about John F. Kennedy’s graduate program in Transpersonal Psychology! That was the best of both worlds: Transpersonal was such a new field back then; in order to get an MA, you also had to get an MA in Clinical Psychology. So I spent four years learning from practicing therapists (in traditional psychology); as well as from transpersonal therapists such as John Conger (who integrated dreamwork and somatics); Jose Stevens (the Michael Teachings), Richard Moss (“Consciousness loves contrast”), and Strephon-Kaplan Williams (The Jungian-Senoi Dreamwork Manual). To have helped more people get in touch with their inner wisdom, power and beauty; be able to take delight in the small treasures that life provides us, and to have more choice in taking effective actions to make the world a better place: That would be my hope.